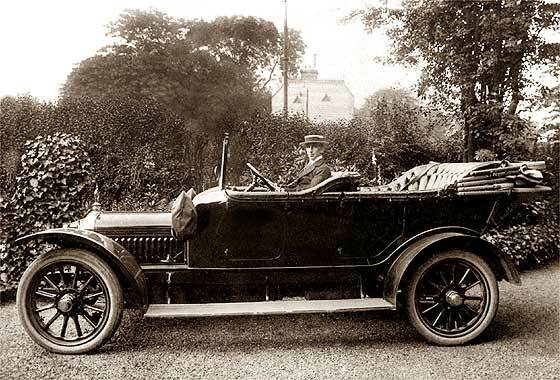 One of two photos received from Frank Hunter (UK) which he was given of cars belonging to his ancient relatives. 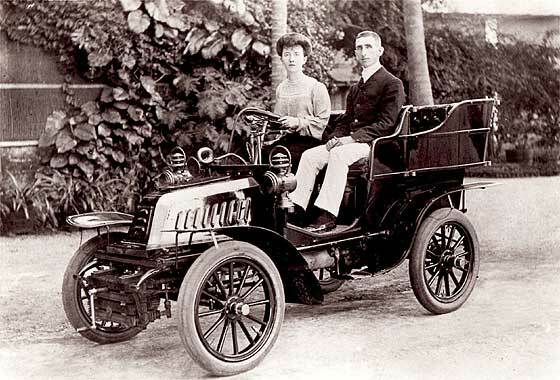 This photo was taken in India and may well have been one of the first cars on that continent. 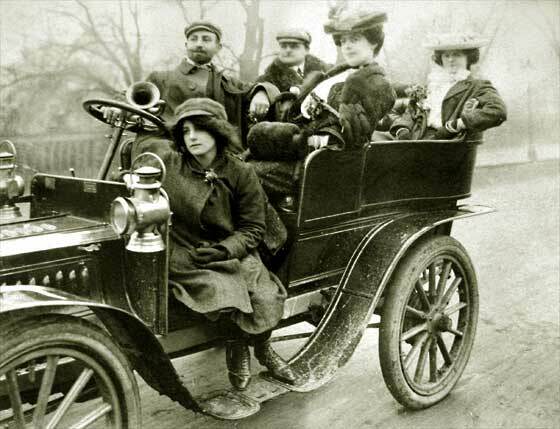 Could be a Renault or De Dion Bouton -- Not a Renault as these in period had side mounted radiators, then rear. The two lever posts beside the steering column, nine louvers, un-joined mudgurds, and un-enclosed and un-surrounded radiator, a cca 1902 De Dion Bouton 8 HP RE Tonneau. Lovely period photo received from Kirstin Sibley (UK) who acquired it around 5 years ago. Original has label of Covent Garden framer so probably taken in London. Looks pretty similar to a 1903 Clement-Talbot rear entry tonneau ? -- Good research, nearly correct. This is indeed a cca 1903 Clement Rear Entrance Tonneau. 1903 cars were imported complete from France. In 1904 they were part UK-made and cars were Clement-Talbot. By about 1905'6 only Talbot name was used. Another from a lovely batch of photos received from Cicos Florin in Constanta by the Black Sea (Romania) who is interested in old cars of Romania. -- This is not a positive identification as same quality coach-built bodies could be on a number of cars and coachbuilder would be responsible for mudguards, running boards and ancillaries of their own design. From the very plain bonnet with small clips this could be cca1905 Mercedes phaeton, poss 50HP. Headlamps are perhaps French. 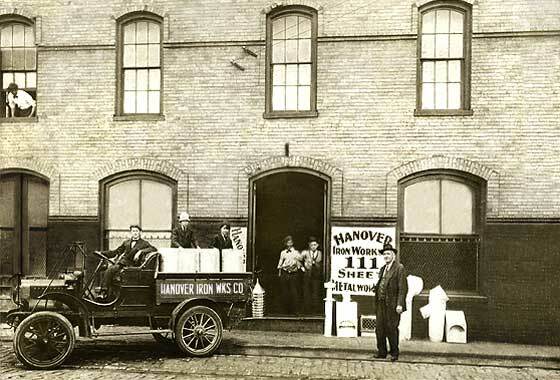 Photo originally from H.T.King of the Hanover Iron Works in Wilmington North Carolina (USA) who are trying to identify the make and model of a truck used by their business. Suggestion is that the photo was taken sometime around 1910. -- The make of the vehicle is relatively easy to identify if you notice the flared lower bonnet which hides a two cylinder engine and a separate flap mid each side for direct access to the spark plug. This seems cca 1907 Maxwell HB Pickup Truck from the 9 louvers. 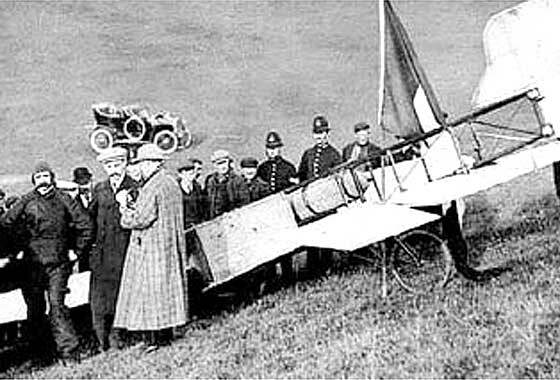 Interesting puzzle posted on the AACA Forum relating to a request from UK for identification of the car in background of photo relating to the first cross-channel flight which ended in a crash landing at Dover on 25th July, 1909. -- This original photo has been repeated many times but we have not been able to find a high resolution enlargement to have a close look at the car which at this magnification is unrecognizable. If anybody knows, please tell us. Possibly a cca 1907 Argyll Side Entrance. Interesting second puzzle resulting from the AACA Forum dealing with Bleriot's landing at Dover on 25th July, 19097. 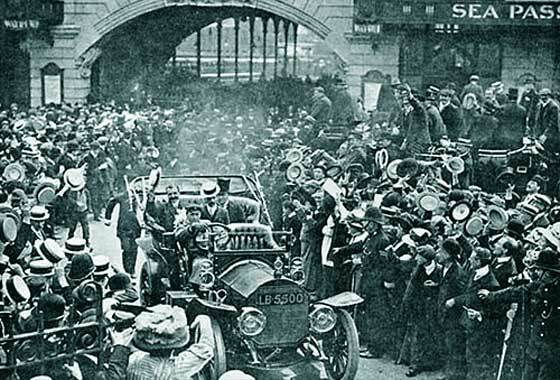 This relates to make of car greeting Bleriot at Victoria Station. -- Carries a registration LB 5500 which is not the 1908 Napier which carries the plates now! The Napier was apparently directly exported to the USA where it remained until the 1970s before returning UK. General feeling amongst our experts is that the car at Victoria is deffinately not the Napier but a cca1909 Mercedes! Another from a batch of photos received from John Dunn (UK) asking for help in identifying the car. Photo was a postcard produced by his uncle Charlie Pinchbeck who was a well known Hull event photographer. The back of the photograph gives chapter and verse saying it is a 1910 Darracq, 12.5HP, 3 speed, twin engine (!) with a Dorkfern & Mahogany Body (? ), fitted with brown leather seats and a 'Dicky' seat at the back. -- Well, not much there to argue with, is there? 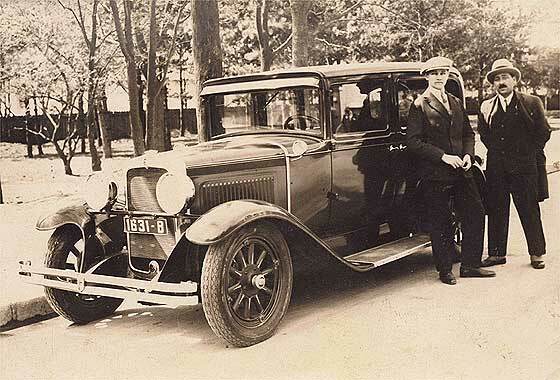 One of two photos received from Frank Hunter (UK) which he was given of cars belonging to his ancient relatives. This photo was taken probably in UK which he cannot identify, but the clue is probably the badge on the radiator/bonnet . -- Actually not much help really as the badge on the top of the radiator cap is a RAC motoring organisation badge. However the shape of the bonnet and louvers of the car are quite distinctive, as indeed are wheel hubs. Body suggests this is a cca1911 Sunbeam 12'16. Another from a lovely batch of photos received from Cicos Florin in Constanta by the Black Sea (Romania) who is interested in old cars of Romania. -- German made Ambulance in use in Hungary. Smart crew despite muddy conditions. 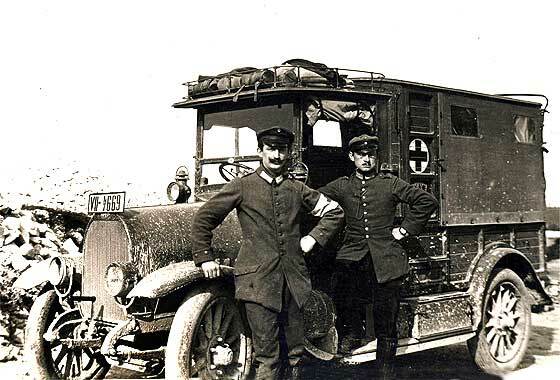 This is a cca 1912 Opel Krankenwagen (Ambulace), probably on the 50HP 1.5 ton lorry chassis. Noticeable pointers are wooden wheels rather than disc, Pneumatic tyres rather that solids, oil and gas lighting, & rounded rather than flat mudguards. 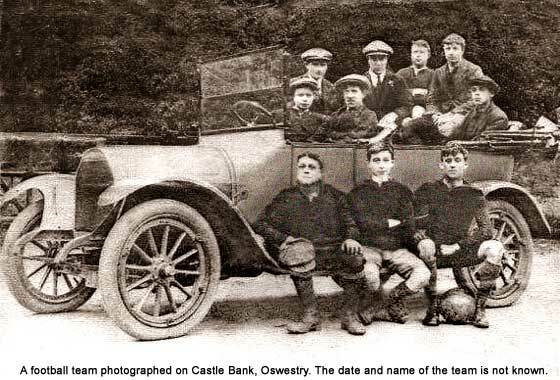 Photo received from Gillian Fynes (UK) who is copying photographs from the collection that Oswestry Library holds so they can to go on line on their new website. 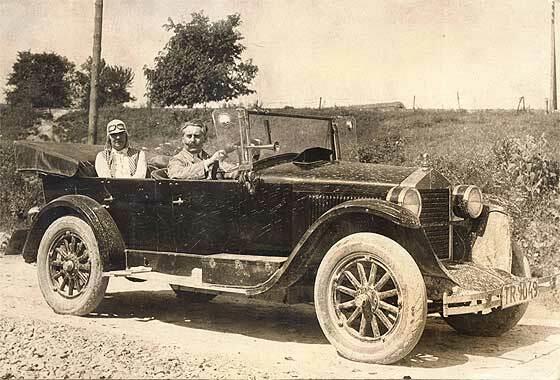 There is no info on the photo but they were just after a rough year, though the car details would be fantastic.-- We advised that from the wheels, and that the car has no headlamps showing they were removable gas lamps, the car is American cca 1912. 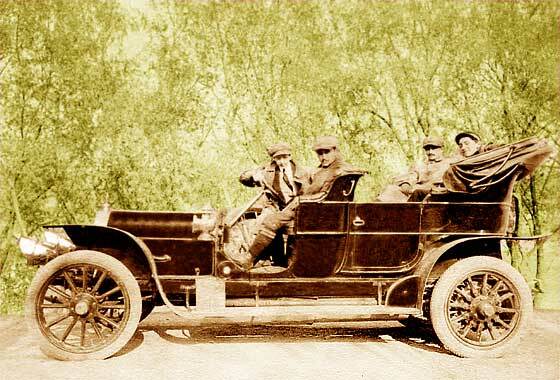 Friends at the AACA could not help, and best guess is 1912 Cartercar. Another from a lovely batch of photos received from Cicos Florin in Constanta by the Black Sea (Romania) who is interested in old cars of Romania. 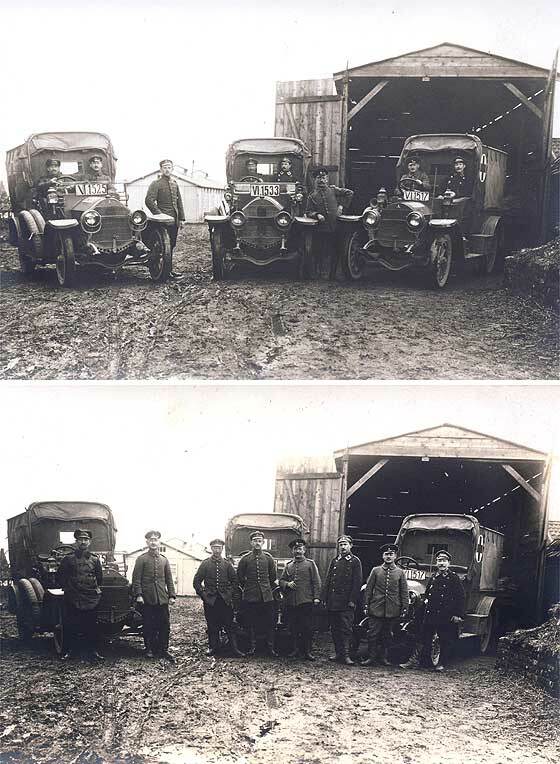 -- Two lovely pictures showing Hungarian soldiers and medics next to their cca 1915 Daimler U2T Ambulances. Daimler-Motoren-Gesellschaft made cars under the Mercedes name from 1902 but continued making commercials under the Daimler name. Type U series started in 1912 and U2T trucks and ambulances were made up to 1921. One of a number of photos received from Andrew Woods, Brisbane (Australia) who is doing some research on his family and came across these pictures. This is notated 1928. -- Despite later sending us much higher res photos, guess the original picture quality was poor because it is difficult to see detail. He thought is was the same car as in the photo with a trailer. Quite different. Looks to us like a cca 1922 Durrant Touring which was called the Star in USA, and Rugby in Oz & elsewhere. Photo received from Bill Stothard (UK) of the Cudworth History Group who have sent us earlier photos for identification. This was discovered in the memorabilia of the late father of one of their group members; no indication of what, where, when etc. -- No louvers on bonnet and square air vent on the bulkhead, so cca 1923 AC Two-seater/Dickey. Model is from the 1920/28 range of 10hp, 12hp, and 12/24 four cylinder cars. Two ranges of trim: basic was 'Empire' and deluxe was 'Royal'. Can't tell. 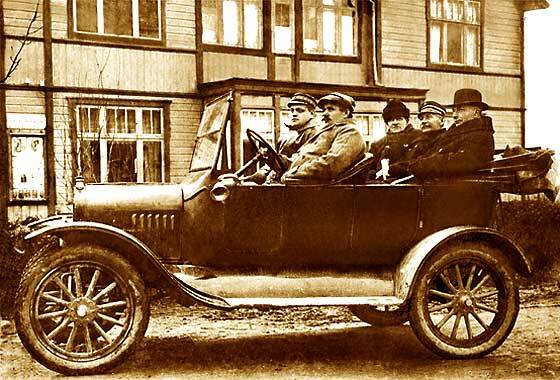 Recently discovered lovely period photo received from Peter Hughes (UK) asking if we can identify the car his great grandfather is driving in Sweden. He thinks it might be a 1923 Ford Model T Tourer, but is unsure. -- Transverse front spring and typically dished steering wheel confirms Model T. The windscreen is slightly raked which means that it is 1923 and later, and six bonnet louvres that it is not post 1925. So the suggestion that this is a cca 1923 Ford Model T Touring is very probable. 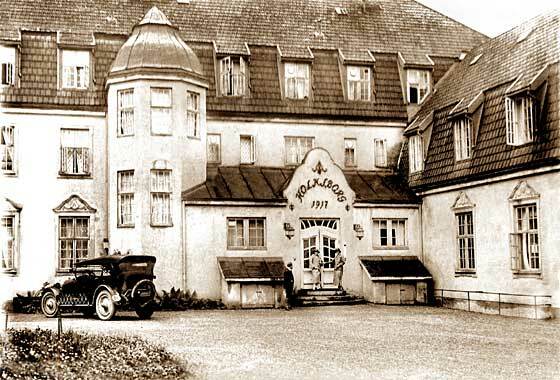 In 2011 we received a photo from Trae Hancock, American in Denmark, where we suggested the car is a cca 1925 Oakland 6-54 Sports Tourer, but could not identify the hotel complex called Holmsborg. -- We have since received information from Gerd Youmans (Norway) that the building was commissioned by Dr Ingebrikt Holm as a Sanatorium for lung diseases. He died soom thereafter and the building became 'Vertakollen Touristhotel'. In 1990 it became the Oslo Montessori-skole. Another from a lovely batch of photos received from Cicos Florin in Constanta by the Black Sea (Romania) who is interested in old cars of Romania. 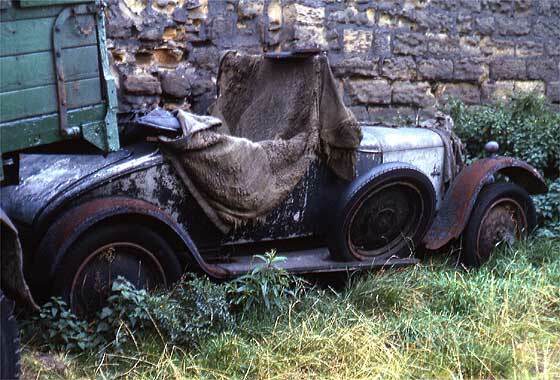 -- This one shows a very muddy American car which was at the top of its range, being a cca 1926 Essex Six Phaeton. It can be relatively accurately dated because it has the nickel plated radiator which did not come into use until July 24th, and the whole shape of the radiator was completely altered (Hudsonised) in 1927. USA cost $795. Another from a lovely batch of photos received from Cicos Florin in Constanta by the Black Sea (Romania) who is interested in old cars of Romania. -- Picture seemed familiar so looked through our records and found that we have two other photos of this car on Help Page 46. Same registration but at one time it was black letters on white background, then possibly a taxi. The car as a cca 1928 Ford Model A Phaeton well wrapped, like the owner, for ferocious Romanian winters. Another lovely bach of photos received from Cicos Florin in Constanta by the Black Sea (Romania) who is interested in old cars of Romania. 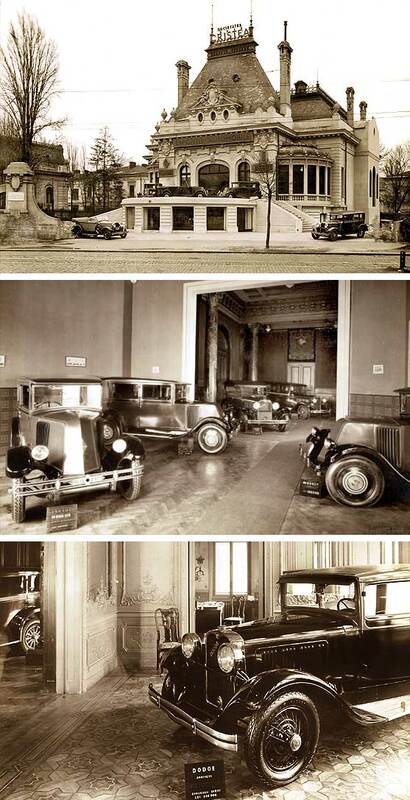 -- Pictures show car exhibition in very imposing building which features Dodge and Renault cars. 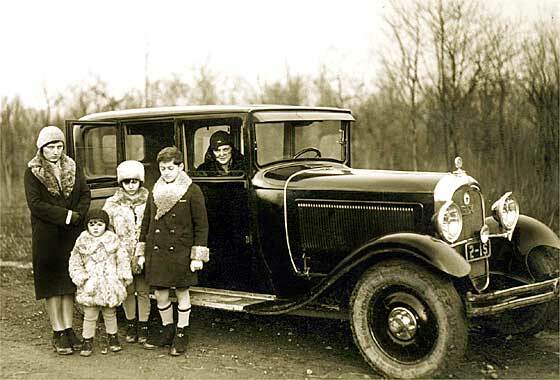 The Dodge car shown is a Victory Six built in 1927 and introduced in 1928. 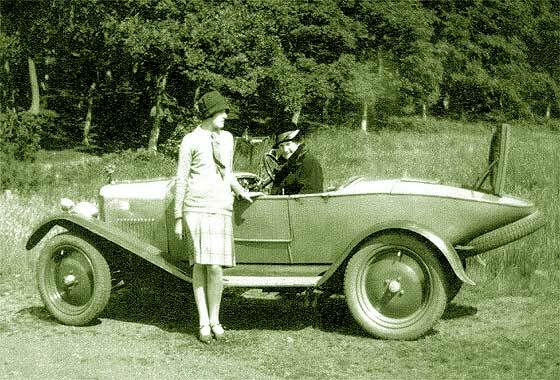 The Renault car is a Mona Six but with a scuttle bonnet and rear radiator so is the 1927 model. 1928 models had radiator/grille at the front. This suggests the exhibition was cca 1928. Another from a lovely batch of photos received from Cicos Florin in Constanta by the Black Sea (Romania) who is interested in old cars of Romania. -- Picture seemed familiar but we could not find it in our records. 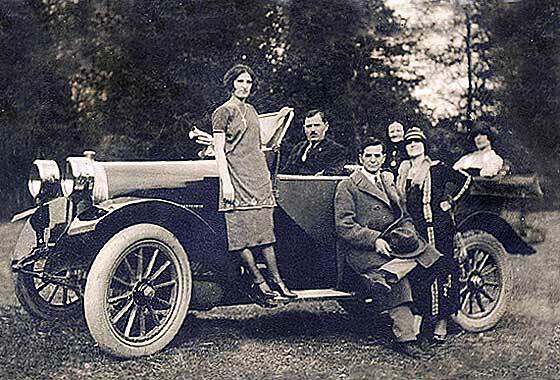 There must have been some very lively agents for American cars in 1920s Romania. Many of the photos from Florin feature American cars so it is nice to actually get one which is European. This one is French, and is a cca 1929 Citroen C6 Familiale Luxe, no hub-caps. Another from a lovely batch of photos received from Cicos Florin in Constanta by the Black Sea (Romania) who is interested in old cars of Romania. -- Another American Car, being a cca 1929 Nash Standard Six Series 420 Sedan. Relatively accurate model and dating from chromed bowl headlamps without a peak (being peaked on the 'Advanced'), with single row of vertical louvers (being double row on the 'Special'), and double bar bumpers. Cost new in 1929 $955 in USA. One of a number of photos received from Andrew Woods, Brisbane (Australia) who is doing some research on his family and came across these pictures. This is notated December 1932. Car with trailer was owned by his Grandfather A.W. King who is the son of J.C. King Jnr. -- Camping in the Outback. 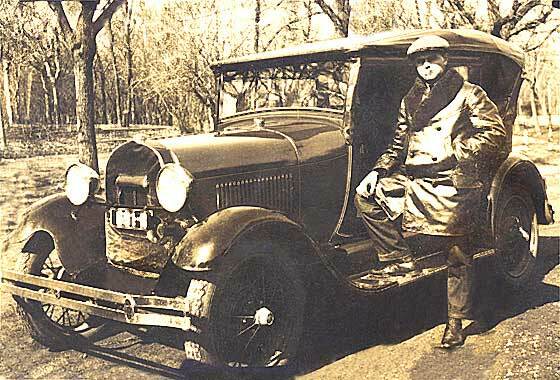 The first two cars are cca 1928 and a cca 1929 Ford Model A Touring. 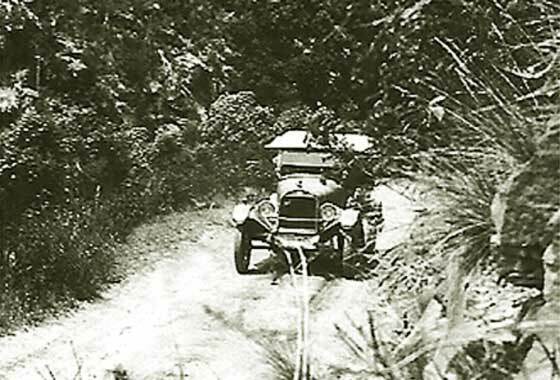 The third car is very fuzzy but with a peak on the rad, so our friends at the AACA suggest a cca1927 Chevrolet AA Coach. 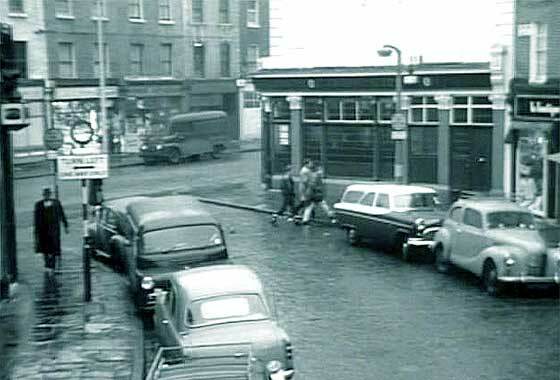 Cinema screen grab of a vehicle which appeared in a British TV series "Gideons Way" made in 1965, where the vehicles are being investigated by IMCDB. Featuring Commander George Gideon of New Scotland Yard in authentic London settings in 1964-5. Made in Elstree and in parallel with The Saint, shearing the music. -- The car being investigated was in the foreground left of the photo. The rear lights indicated this was a cca 1960 Ford Popular 100E Saloon. Two ranges of Pops built 1953-59, - 62. IDENTIFICATION AND DATING: Glider Launch Vehicle? 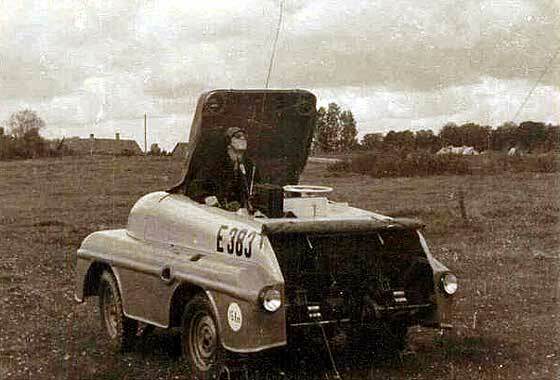 Photo of an unusual military Vehicle received from Janis Dumpis from Riga (Latvia) seemingly of East German (DDR) origin. -- We regret this enquiry is a little bit too specialised for us. Our knowledge base relates mainly to the general veteran and vintage vehicle scene, but we have no experience in military vehicles. However, we note that the chap is looking to the sky, and there seems to be a cable coming out of the back of the vehicle, which suggests this could be a glider launch vehicle. Another from a lovely batch of photos received from Cicos Florin in Constanta by the Black Sea (Romania) who is interested in old cars of Romania. -- This picture we have received before and it has done the circuit of all our experts without anybody being able to provide an identification. We are relatively sure this car is European and has very imposing high headlamps of a Teutonic pattern hiding the all important radiator. Interesting pointed front mudguards. Could be cca 1925 Audi? Intriguing photo received from Neil McMurdo (UK) taken near Burnmouth, Berwickshire, Scitland and on Facebook page called Burnmouth Past . -- Actually a very difficult one which we have not been able to crack. The body is very attractive with a Dickey Seat in the back, and is very reminiscent or is a copy of of the 1923/32 Alvis 12'50, which it is not. The body style is called " Ducks Back ". Subsequently identified by Tim Harding Help Page 55 as cca 1926 Rover 9/20 Sports. As can be seen from our Help Pages we normally do succeed in identifying practically all vehicle photos which we receive. Occasionally some photos may take time and very occasionally we get stuck. Clicking on the photo on the right opens the page containing some of the earlier photos we are yet to crack ! Any help would be very much appreciated, as would any corrections. Other more recent unidentified pictures are normally at bottom of each Help Page, above this panel.